GOLD Coast captain Gary Ablett has been ruled out for the rest of the season and requires surgery on his injured left shoulder. Ablett, 32, was injured when attempting to tackle Mitch Robinson in the final quarter of the Suns' 26-point win over the Brisbane Lions. It is the same joint he required a reconstruction on in 2014, but Suns football manager Marcus Ashcroft told goldcoastfc.com.au it is a different injury. "No reoccurrence of that episode, this is a totally separate injury," Ashcroft said. However, Ablett will again require surgery. "He'll miss the remainder of the year. He'll need to get some surgery at some point," Ashcroft said. "Again, he'll consult with Greg Hoy, who did his shoulder last time, in Melbourne, early next week. "The determination as to when he'll have surgery and as to what length of surgery he'll go through will be determined then." Ashcroft expects the superstar to be available for the full pre-season. "That's the planning. It won't keep him out of any pre-season training." It is the third consecutive season Ablett has failed to play more than 15 games with shoulder and knee injuries ruining his 2014 and 2015 campaigns. 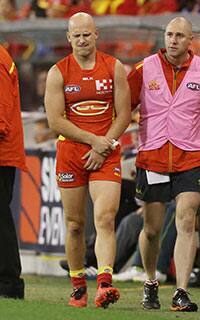 Ablett was annoyed at the timing of the latest injury. "Injuries are part of the game and it’s frustrating that I will miss the rest of the year – in particular after we’ve worked hard to get back to playing a much more competitive style of footy," he told goldcoastfc.com.au. Ashcroft also confirmed vice-captain Michael Rischitelli will require a reconstruction on his right knee after rupturing his ACL while attempting to tackle Robinson.